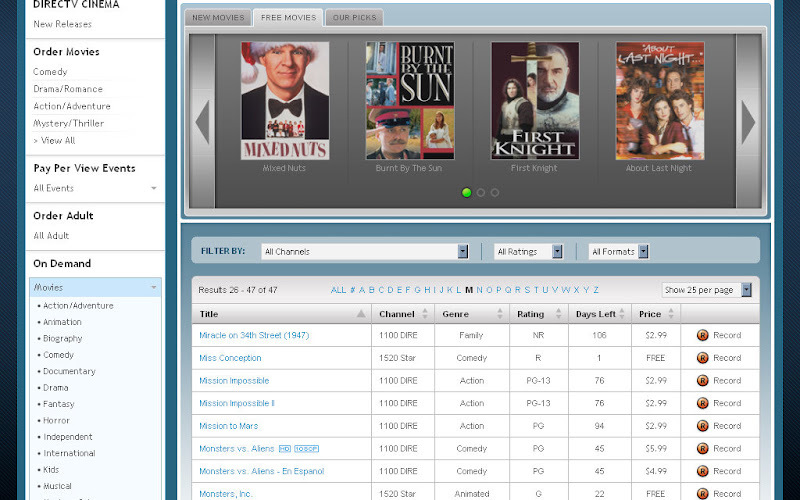 I go to the DirecTV website On Demand program guide to see what free movies are currently available. This web site allows DirecTV customers to both view the available programming and remotely program their DVR to record a program. I select movies on the left navigation menu. I then click the Free Movies tab at the top. What looks like movie DVD cover images are shown above the list of available movies. M at the top of the movie list. I browse through the alphabetical list to where I expect to find the movie Mixed Nuts. It is not there. Additionally, after having selected Free Movies, I am being showing movies that aren't free. Perhaps the images at the top and the list below use different data? Since writing this, I have returned to the site and clicking the moving icons at the top is now displaying additional information and an option to record the selected movie. This movie, however, was not listed.